Hi there! I’m so excited to share a review for a newly published contemporary YA romance from Paula Stokes. GIRL AGAINST THE UNIVERSE s a bittersweet contemporary YA adventure/romance that deals with PTSD, OCD, and general anxiety in a teen girl who’s survived some pretty tragic moments. Maguire was eleven when the car she rode in went off a mountainside and her father, uncle and brother were all killed. She was twelve when she rode a rollercoaster that went off the track, seriously injuring all 19 other passengers beside herself. She was thirteen when she went to a slumber party where every other guest ended up with gut-clenching illness. And six weeks ago, her abandoned candle burned down the neighbors’ house. Maguire believes that she’s Really Bad Luck, and she has a notebook filled with instances and coincidences that back up this claim. Now sixteen and living in her third house in the past four years, preparing to enter her second high school, Maguire wishes she could just be home-schooled. She doesn’t want to make any friends, and potentially be responsible for any of them getting hurt, or worse. Worried about Maguire, her mother insists that she attend therapy, and this is where the book opens, in a therapy session between Maguire and Dr. Leed. When the hour is up, Maguire notices the tall, attractive boy who enters the office in her stead. This boy, Jordy, reaches out to prickly, unapproachable Maguire as part of his own “homework” for therapy. And, they sort of hit it off. Maguire learns that Jory is semi-famous, but none of that seems to matter and Jordy appreciates that. Inspired by Jordy, and knowing that she needs to get over her many phobias if she’s going to fly to Ireland with her mother for a five year memorial for her father, uncle and brother, Maguire actually begins to engage in her therapy. She’s terrified of riding in cars with people, using public transit, being out in public, going to parties, and has terrors imagining a bus ride, let alone a trans-Atlantic flight. So, with Dr. Leed’s help, Maguire sets her own list of “homework” so that she can reclaim her life and defeat the sinister powers of the Universe that have ripped so much from her. This is a bittersweet read, because Maguire is a kid trapped by tragedy. She has a loving mother, step-father and new step siblings, but she dwells in the past. She’s terrified of her own mystique: believing that she’s cursed. By really engaging with her therapy, and investigating the truth of her situation, Maguire learns to overcome her anxiety, by reasonable measured steps and slowly escalating “risk.” It was an affirming story, that realistically demonstrated how a kid struggling with several mental issues could overcome her fears by challenging herself in safe ways. I really liked that there weren’t a ton of catty gals, or hecklers. I liked that Jordy was a stand-up guy, and that he never gave up on Maguire, even when she did hurt him, succumbing to her fears when he needed her most. Maguire’s self-discovery wasn’t all forward motion, which was also reasonable. She had backward steps and tough choices. She cried, and she healed, and she fretted, but she made it all happen. It takes courage to go on, and survivor’s guilt was also likely a big factor in Maguire’s self-isolation. I really dug the whole arcane “luck” charms that Maguire built into a ritual, not for herself, but because she wanted to ensure the safety of those around her. It’s rather ironic that she never wanted herself to be safe; she expected her bad luck really only affected those around her. Jordy was a great guy, and I liked how down-to-Earth he was. He’s got a bright and shiny future all laid out, but agonizes about his people-pleasing tendencies, and the high likelihood of failing to set proper boundaries. These were reasonable issues for an athlete of his caliber, and his pathway through therapy was also interesting. For a teen romance, this was really tame with only a few kisses, some dithering regarding embarking on an official relationship v. secretly dating. Those issues held real relevance for Jordy, as approached legal adulthood and struggled to assert his autonomy over that of his parents’ wishes. In total, the book was a clean read with plenty of morbid reminiscences and a healthy portrayal of mild mental illness, teen relationships, and healing. I’d wish Maguire luck, but I think she’s learned that she makes her own. Interested? 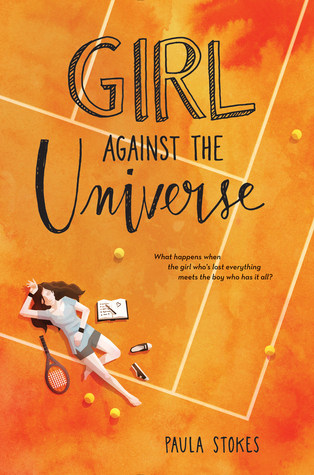 You can find GIRL AGAINST THE UNIVERSE on Goodreads, Amazon, B&N, Kobo, Book Depository, and IndieBound. You can catch up with Paula on her website, Facebook and twitter.